For some collectors, condition is everything. If it's not perfect, it belongs to someone else. Others are willing to ignore the occasional dent or crack or chip. Let's look at the subjective concept of condition. When I first started buying radios I bought a lot of damaged goods, and experienced considerable disappointment. That still happens to me occasionally today, but nowhere near as often now. It comes with the territory. Heck, this stuff’s half-a-century old already. There are some things to look for and questions to ask whether buying online, or at a swap meet or from a fellow collector. Here are some suggestions. When shopping, look for cracks, chips, scratches and dents. These defects lower the value of any collectible. Some of this is inevitable, particularly on pocket radios that were used, abused, dropped, and so on. When these flaws are on the bottom or back of display pieces that will always sit on a shelf the damage will be less disturbing than if you plan to routinely hold or use the item. But any set’s monetary value might be decreased by 20 to 60% or more if it has significant external damage of any kind. It is sometimes possible to repair cracks, scratches, and even small chips. I cover these techniques in the Tips and Tricks section of this site. If a collectible (particularly a plastic radio) was left in the sun, parts or all of the plastic and even metal parts might be discolored. If the radio was kept in its leather case, the sun damage might be uneven. Always ask to see a radio out of its leather case! This uneven damage is usually almost impossible to repair. Very few vintage radios are complete when you find them. Unless you are lucky enough to find new old stock (NOS), you probably won’t always get everything that originally came with the radio—the outer box, owners manual, warranty card, earphone, leather case, cleaning cloth, battery and so on. Quite a few radios come with at least some of these accessories and these extras do add value to most collectibles. But generally, a crack-free, perfect looking, strong playing Zenith Royal 500H will be worth quite a bit more than one with a missing handle or knob but includes a leather case and earphone. You also need to use care when mixing and matching. Placing the back from one radio onto the front of another can create color match problems and potentially serial number inaccuracies if the serial number is on the inside of the back cover, as just one example. Mismatches like this can happen innocently enough as well, by the way. If you display similar radios side-by-side it’s easy to put them back in the wrong boxes. I’ve seen this happen with and go undetected for decades, as was the case with some of the display radios from that closed radio shop I wrote about earlier. Swapping the working innards of one radio with the perfect case of another might be tempting, but the purists in our midst will insist, accurately, that this is not preserving the integrity of our collectibles. There were subtle variations made to many radios over time as Eric Wrobbel and Norman Smith’s books go to great lengths to point out. Just because you can fit a working Sony TR-63 board into a better-looking case does not mean you should do that. If you do, I think you should keep the old parts, and records of what you have done. And if you are buying one of these important collectibles it’s important to know if it has been thus modified. One last note on this topic: Once in awhile you will come across a radio that does not look “right” because it was repaired, under warranty, at the factory, or perhaps by a local repair shop decades ago. Sometimes those factory service centers placed stickers inside noting that the set had been serviced. I think this adds to the value of a set, and is always a wonderful discovery on the rare occasion that I find one. Broken Knobs, Whip Antennae, etc. These old radios do wear out, particularly their moving parts, and again, within limits it makes sense to me to swap a perfect knob or whip antenna from “parts” radio with a damaged item. You do want to look, and ask about damage like this when shopping. Sadly, a very good test of a radio is to simply shake it. If it rattles there is a good chance that it will not play, and that repairs have been attempted, and that at a minimum, it is missing some hardware inside. Important electronic components might have been harvested as well. I learned this the hard way after purchasing a large, significant collection. If a radio rattles, ALWAYS ask if repairs have been attempted. If at all possible see the insides for yourself before purchasing it, especially if it is a significant, important, potentially valuable model. 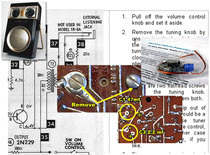 Many people know how to take radios apart. Not all of them have the skill or patience or the parts necessary to fix them. Some of these folks don’t put them back together properly when they lose interest. Here are some other clues that should make you wonder about a radio’s history and integrity. Early radio makers didn’t want us to fool with their sets. They offered warranties and needed an easy way to insure that owners didn’t void them by taking the sets apart. They accomplished this with dabs of paint that will remind you of fingernail polish. This was usually applied to just about every screw head or nut on the radio. No doubt this paint also kept screws from loosening, a useful goal for anything as portable as a pocket radio. So, when you see broken paint chips near screw heads, (like the damage shown in the photos), you should assume that the radio has been fiddled with. This is not always a deal breaker, unless you are a perfectionist, but it is an indication that you should ask more questions. Like the broken paint previously mentioned, chewed-up screw heads and mismatched screws just scream “I’ve been opened!” The artifact is trying to tell you something. Pay attention to these warning signs when shopping. Ahh. My favorite. Inside just about any radio you will find square metal cans with what look like screws on top made of powdered metal. Sometimes there will be paint or even wax securing these. If the paint is broken, or some but not all of the wax is missing it means a previous owner or repair person has messed with those screws. But they are not really screws, they are coil adjustments. Skilled service techs can improve a radio’s performance by adjusting these coils. On the other hand, unskilled screwing with these adjustments might make a radio temporarily mute. It is also possible to damage the coils and slugs to the point where the radio will need significant repair (up to and including replacing one or more of the cans). When you see evidence like that in the photos, make sure the radio plays well if that’s important to you. To learn more about those little cans, what they do, and how to adjust them checkout the third book in this series titled Servicing Transistor Radios. 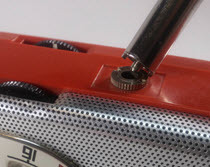 Alignment is also covered on the DVD Restoring Pocket Radios. 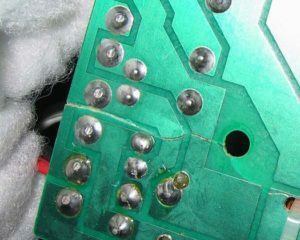 Circuit board contain thin metal traces that act as the radio’s wires. For the radio to work the traces must be intact, and the board can’t have cracks that run through the traces, breaking the circuits. Here again a photo saves a thousand words so take a look at the example. Damage can occur if a radio is dropped, or if the circuit board was improperly reinstalled after being removed. Not always impossible to fix, repairing cracked boards can be challenging and time-consuming, so before buying a radio with a broken board, give it some thought if you hope to make it play some day. I have touched on this already. Cabinet colors that don’t match, knobs that don’t match contemporary transistors parked next to vintage ones on a circuit board should all set off alarm bells. Don’t be afraid to ask how things got the way they are. It’s amazing how many plastic radios still look great today. Plastic does melt, though. Solar radios from Hoffman, Zenith and other are particular candidates for heat damage. People used to park the solar cells near light bulbs to power them, which was the equivalent of putting their radios in Easy bake ovens. Non-solar radios can melt too. Leaving one on a car dashboard can cause warping and worse, for example. “Wire wrap” is another type of melted plastic damage which occurs when two dissimilar types of plastic remain in contact with each other. 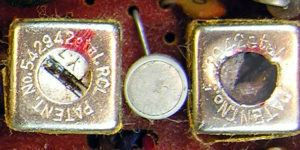 The most common examples are the ugly ridges found on “Rocket radio” crystal sets that kids often stored with the earphone wires wrapped around the rocket. (Hence the term wire wrap damage.) But other earphone sets besides those rockets suffer from this, including many Boy’s radios. The damage can also occur when inexpensive sets are stored in cheap plastic protective cases rather than leather cases. The two plastics—the radio’s and the “protective” case interact, damaging the radio’s surface. Sometimes this can be sanded or polished out, but not always. A third form of melting results from careless repair work. When folks attempt soldering repairs with sets still in their cases it’s easy to graze the plastic with the soldering iron, sometimes causing serious damage. Here again. Ask to see radios out of their cases, and look at detailed photos, or better yet, hold the radio in your hand if you can. Old batteries leaked like crazy when left in radios too long. Sometimes this can be a deal breaker, other times it’s leakage problems can be solved with some sandpaper or a Dremel grinder. More serious cases might require replacing the battery contacts or battery holder altogether. The severest leaks can actually damage a radio’s circuitry to the point where restoration is impossible, or at least impractical. Salt air is another source of corrosion, and you will find it inside, and on the exterior of many radios that lived at, or near the beach. Sometimes salt air exposure simply causes appearance issues, other times it can make radios forever inoperative. 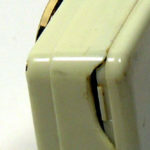 Book 3 in this series Restoring Transistor Radios takes you through many corrosion assessment and abatement techniques. Many mid-century radios were owned by kids. We drilled holes and attached brackets so that the radios would live on our bicycle handlebars. Some folks nicked out parts of radio cabinets to run wires outside so that an AC battery eliminator could be used in place of batteries. Some experimenters drilled hoes in cases so that they could “fine tune” their radios with the backs in-place. No earphone jack? No problem. Add your own. Live out of town and want to use an outdoor antenna? Add an external antenna jack. You get the idea. Perfectionists flee from sets thus modified. Other collectors are intrigued by them, particularly if the modifications are useful, elegant or innovative. That’s what makes this all so much fun. Unlike the field of porcelain collecting there are not too many fakes in the mid-century radio world. There are some reproductions though and beginning collectors should be on the lookout for them. The one that seems to get quite a few beginners is the disarmingly charming AM/FM Beach Boy radio pictured here. It’s nice. It’s fun, but it isn’t a mid-century artifact. The Chinese are just messin’ with ya. There are also some reproductions of early rocket radio crystal sets surfacing these days, so be a little leery of those as well. It’s worth mentioning here again that many of our childhood radios still play. Most of them, however, will die before we do. As collectors we will each need to decide what this means to us and an our collections. Our parents and grandparents are just as torn about their old radios and other electronic devices that have already reached the age where their capacitors need replacing, (the radios, that is, not our relatives). This is another good reason to hang out at a local radio museum. Hear both sides of the story. Get some perspective. Decide for yourself. If you do decide that you want to acquire non-working radios and make them play again, which can be a lot of fun by the way, look for radios that are worth fixing. That is to say, buy radios you will want to keep and use before spending hours repairing them. Unless, of course, all the fun for you will be in the fixing. Another tough question to ask is “can I ever make it right?” Consider the big early Raytheon T-2500 in the photo. It is missing the Raytheon badge that belongs in the lower right corner. Since so few of these radios were made, the chances of finding a parts radio or just a replacement badge itself are slim-to-none. So, if I want to own a perfect-looking Raytheon T-2500, this one is probably not it. But if I want a really nice, rare, early, working, rich sounding radio with those old blue Raytheon transistors and the hand-wired chassis and all the other things this radio has that give me goosebumps, maybe I do want it. Right is a relative term, of course, so maybe this is, or could be the right 2500 for me, but not for you. How much does condition matter to you? Should some radios never be restored to protect their authenticity? Can you suggest corrections or additions to this page? Leave a comment below. I’ll review comments and post or incorporate the most useful ones. Your email address is required if you choose to comment, but it will not be shared.